Exporting data from Enterprise Vault Mailbox Archives or Journal Archives can be overwhelming – especially if you have a ton of messages to move – but either way, it doesn’t have to derail your day-to-day work! Hard to believe? Watch this short demo and see for yourself! In this recent demo video, you can watch Dave compare two methods: using Enterprise Vault alone, “out of the box”, and using EV in conjunction with Archive Accelerator Export from Vault Solutions. Beginning by using Enterprise Vault alone to export files from your EV Archives, you can use the wizard to export your data to .PST files. This works well when you have a handful of files to be moved, but if you have thousands, or hundreds of thousands, of messages to move, this is tedious and will eat up your week, let alone your day! This is where Archive Accelerator Export comes in. You select your archives to export, and monitor your progress. Simple as that! But what if you need a bit more control over your export? AA Export comes with Filtered Export, which gives you the ability to export data from your EV internal archives for the targeted user. This is quite simply as easy as creating a target. You then select those targets for export, and Export puts them in the job list where you can continue to monitor progress. How can it possibly export that many messages? And that efficiently? Dave shares this and more in the video above. Make sure you take 7 minutes and check it out, and look here for additional info about upcoming enhancements! When I was product manager for Enterprise Vault Compliance Accelerator (CA) and Discovery Accelerator (DA) about 10 years ago, I worked with many large financial institutions that used those products in earnest (and of course, many still do). They are both quite comprehensive products, and their many features are there due to customer demand. Discovery Accelerator is typically used to respond to eDiscovery requests including criteria such as all messages with certain keywords, sent to or from a defined list of ‘custodians’, and/or over a particular date range. DA has the flexibility to create a Case, create searches to put items into the Case, perform reviews of those items, and export relevant ‘responsive’ messages. Discovery Accelerator does that task admirably, but several of our largest customers would ask me for an efficient way to export data with less administrative overhead, and with an emphasis on performance. There were situations where they didn’t need the eDiscovery aspects of the product, but just needed a quick way to get a fair amount of data out of the system. They wanted a way to just export all data for a number of custodians for the last 6 months, for example. The IT department would get a lot of requests like that, and though it can be done with DA, it takes more administrative work and time than it needs to. We built our Archive Accelerator Export as a way to respond to the simple non eDiscovery requests. In fact, Vault Solutions was commissioned by Symantec to create Archive Accelerator Export for a large customer that had 10’s of Terabytes of data to export, a task for which DA was not designed. We’ve since sold it to many companies worldwide that had a simple need to export a lot of data from EV in as short a time as possible. We built Archive Accelerator Export (AAE) to give companies the ability to conduct fast, highly robust mass exports of data from Enterprise Vault. Information can be exported for third-party analysis, taken offline for long-term storage, preserved in a non-proprietary format, or migrated to a separate archive for any number of reasons. This past summer, we released the latest version of Archive Accelerator Export with several new features aimed at significantly improving functionality. We’re particularly excited about Targeted Export and its ability to be flexible with the data that’s being exported, especially in larger organizations. Typically, the journal archive is a mix of everyone’s data, not organized or separated by any folder structure. It’s great when used for eDiscovery or compliance exercises, but doesn’t allow for granular data exports. Targeted Export allows for the efficient export of a particular user’s email from the journal archives, enabling you to target specific emails by person and date range rather than having to export the entire archive. In addition, large companies with more than one brand under their umbrella, or those that have changed names, can also search and export based on domain. Although flexibility is a welcomed improvement, another crowd pleaser is speed. We optimized AAE’s performance by increasing speed with a new 64 bit architecture (see graphs). 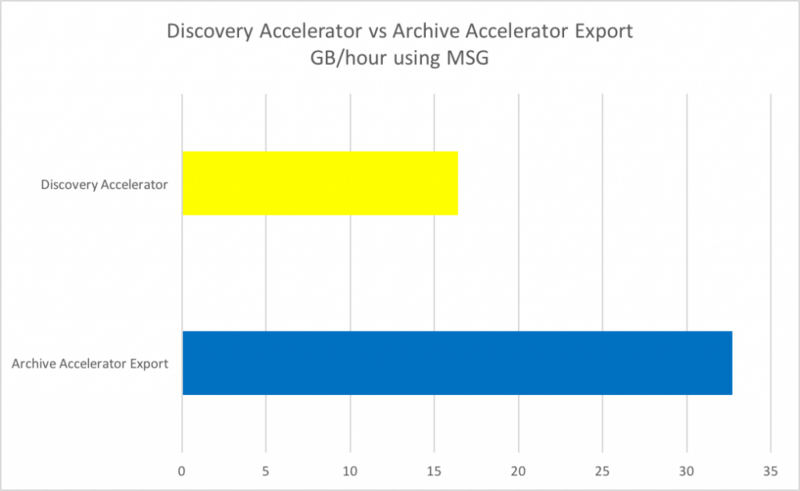 Whether exporting .MSG or .PST files, Archive Accelerator Export exports more gigabytes per hour than Discovery Accelerator. Worth noting in these visuals is the type of file, and the difference in export speed. In the same amount of time, AAE can export 32.7 GB of data in .MSG, and only 14.6 GB in .PST format. .MSG, which exports the data in individual messages, is 2x faster with Archive Accelerator Export than Discovery Accelerator, and nearly 3x faster than exporting in .PST, making it the preferred file type when possible. 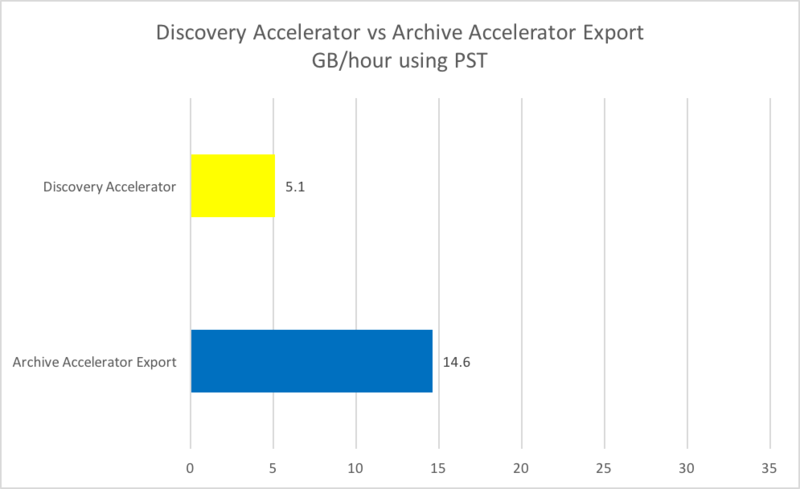 It is sometimes impossible to avoid exporting .PST files, but when that’s the case, it’s important to note that in both formats, Archive Accelerator Export transfers at least 2x the data per hour than Discovery Accelerator. Of course, all this being said, AAE is no replacement for DA when there is a need to perform other eDiscovery tasks such as keyword searching and document review and marking. 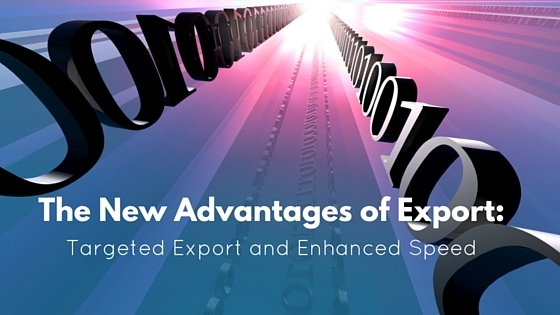 Read more to learn how Vault Solutions’ Archive Accelerator Export can help target the data you need to export.